With the homeowners newly retired, they chose a new development to build their “down-sized” house. 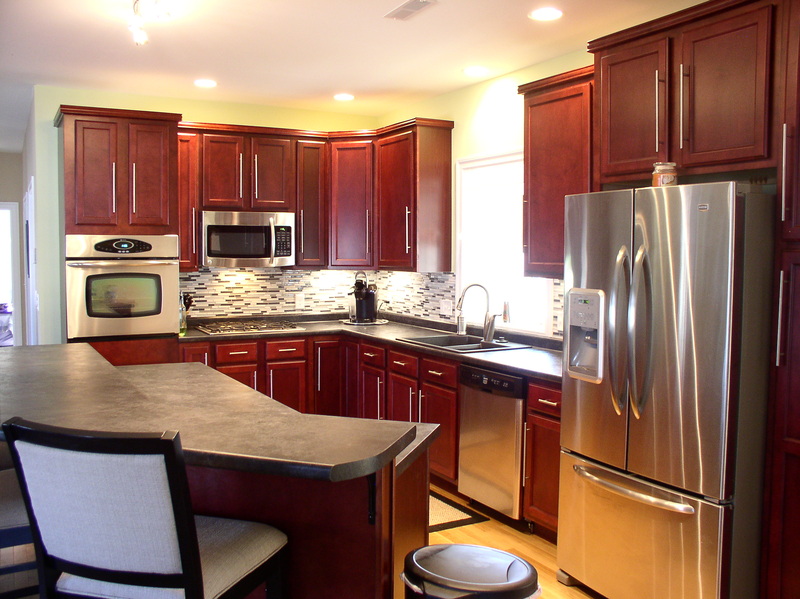 Simplifying their life and living off of a pension, they wanted a simple and affordable cabinet with post-form laminate counters to contain costs. Mrs. Roberts still enjoys cooking/baking and didn’t want to give up opportunities to have their children and grandchildren over to visit while she was in the kitchen. With great open space, I created a “gourmet” style kitchen on a reasonable budget with a two-tiered angled island to allow for plenty of seating and accommodate space for the cook to move freely about. Separating the oven in its own tall cabinet balanced the large refrigerator on the opposite end and puts it at a higher level to easily take items in and out. Adding the drawers below the oven for foils, wraps, pot-holders and lids along with roll-out shelves below the cooktop for pots & pans really made a functional and efficient cooking center. For storing cookie sheets and trays, a tall vertical tray cabinet between the oven and cooktop adds to the ease of use and efficiency of space.